...... If you are making a disc for a party, you usually don't want all songs of the same artist to play sequentially nor may you want songs to play alphabetically. 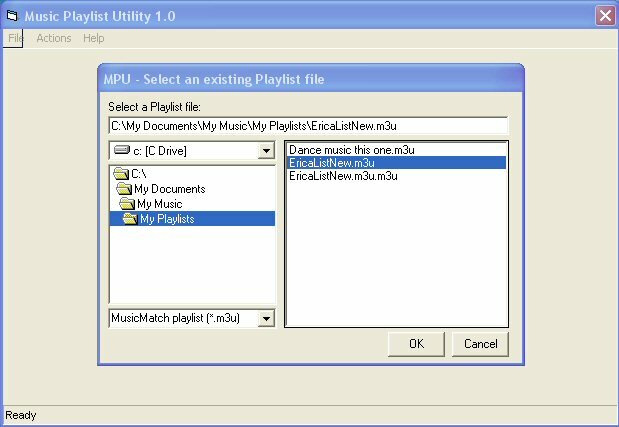 Music Playlist Utility reads your playlist and renames the music files with a numeric prefix so that the songs will be burned and played in the exact order that they appear in your playlist. Once you have completed buring your CD, you can use Music Playlist Utility to rename the music files back to their original filenames. Qweas is providing links to Music Playlist Utility 1.0 as a courtesy, and makes no representations regarding Music Playlist Utility or any other applications or any information related thereto. Any questions, complaints or claims regarding this application Music Playlist Utility 1.0 must be directed to the appropriate software vendor. You may click the publisher link of Music Playlist Utility on the top of this page to get more details about the vendor.